In this episode of the MenChat series, Yahnathan concludes his discussion with author Kevin S. Carr by addressing the question: How to reverse or break bad dating habits? 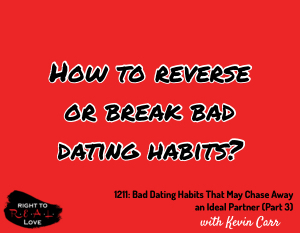 How to reverse or break bad dating habits? Things to discuss and avoid discussing when dating. The dangers of not addressing bad dating habits that you’ve developed. The value in praying about and for the people you date. Benefits of spending time alone before dating. The importance of having the proper boundaries in place when dating. Yahnathan opens up about some of the bad dating habits he used to have. Building on the right foundation is vital to effectively date successfully. Reflect on previous connections to determine whether your dating habits are good or bad. Pray about the people you date or are considering dating.